Notice that the Resurrection itself is never described in the gospels. There was no-one there to see it. Instead, the evangelists tell us how Jesus’ resurrection was discovered. They knew they were describing something incredible, and they wanted to do so in as credible a way as possible – hence the witnesses, people who were there at the scene. 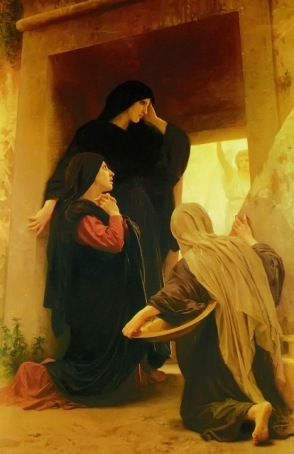 The witnesses were specific people – Mary Magdalene, John, Peter, etc. As with all eye-witness accounts there are differences in details, but the main points are clear. In the ancient world it was women, usually family members, who washed a corpse and laid the body out for burial. In this case, the task was given to Mary Magdalene, Mary the mother of James, and Salome. They had cared for him in life, and now they would care for him in death. The normal thing was to wash and clean the body first. In Jesus’ case, this would have been a difficult task, since his body was heavily matted with dried blood. In the second stage of this cleansing, the women would have added spices to water and gently smoothed this liquid over the body. Then they would bind the arms and legs so they were held firmly, and wrap the whole body around with a long strip of linen cloth – the shroud. This was the simple, gentle act performed by women for the people they loved. And this was what the two Marys and Salome expected to do. 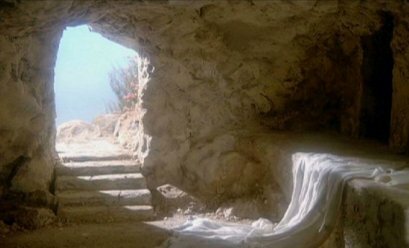 But when they reached the tomb, they were greeted by an unexpected sight. The stone that covered the entrance of the tomb was no longer in place, but rolled sideways so that anyone might enter the tomb. They were frightened and astonished by this unexpected sight. When they had left the tomb on the evening before the Sabbath, they had placed Jesus’ dead body on one of the stone slabs inside the tomb, and then the entrance to the tomb had been firmly closed. But now the body was missing, with no sign of where it had gone. 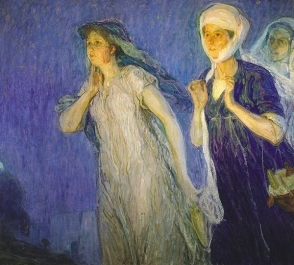 What did the women find at the tomb? A normal reaction would have been to think that someone had stolen the body – Peter might have done it. He had a reckless streak and was ashamed of his denial of Jesus at the house of Caiphas. But the body had not been stolen by anyone, friend or foe, and the women were perplexed. The answer came swiftly. 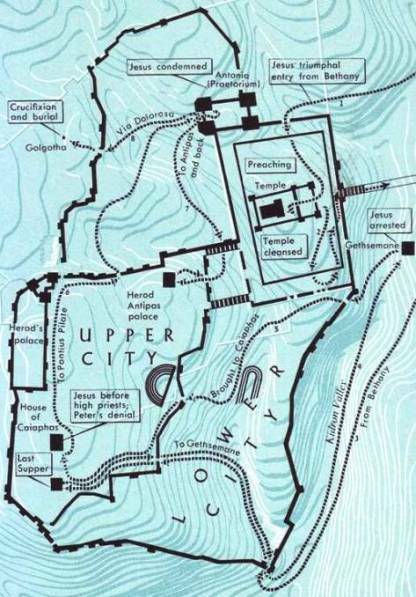 In the place where the women expected to find Jesus’ body, there were instead one (Luke says two) beings whom the gospels call ‘angels’, dressed in the white garments associated with heavenly beings. This is a difficult concept for modern readers to understand. 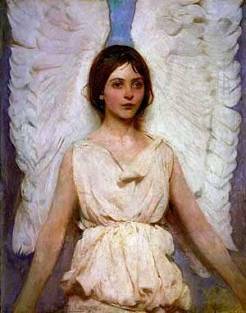 ‘Angels’ do not form part of our way of thinking. The modern reader can perhaps better understand this gospel passage if they think of angels not as messengers from God, but as the message itself, given and accepted. they should tell others about this – especially the disciples and Peter. Peter would later gain comfort from the fact that, despite his earlier denial, Jesus singled him out as a key figure to be told. How the women gleaned this information or from whom, we do not know, other than that the gospels point to the source of information as an ‘angel’. What did they mean by ‘angel’? They were simply but emphatically stating that the information was irrefutable. They believed that God (or God’s messenger) knew all that happened, and would not lie. They knew that Jesus had risen, and they wanted to give this truth the weight of God’s backing. What did the women do? The women were horrified by the loss of Jesus’ body, and dazed by the alternative possibility that he was alive. They were sensible peasant women, not given to flights of fancy. The idea that someone could be dead and then not dead must have seemed utterly incredible. They knew it would certainly seem so to anyone who heard about it. What did ‘risen’ mean? Who would believe them when they described their experience? At the same time the women were elated, and ran back to the house where they were staying, where many of Jesus’ disciples had gathered. They offered hope in place of despair. Mark’s gospel says they told no-one, but presumably this means no-one other than the disciples. They were greeted with disbelief. This was surely a fantasy dreamed up by hysterical women, the disciples reasoned. Women’s testimony was not given the same weight in a court of law as men’s was, and no doubt the male disciples thought at this moment it was a good idea that it should be so. 1 Now after the Sabbath, toward the dawn of the first day of the week, Mary Magdalene and the other Mary went to see the sepulchre. 1 And when the Sabbath was past, Mary Magdalene, and Mary the mother of James, and Salome, bought spices, so that they might go and anoint him. 8 And they remembered his words, 9 and returning from the tomb they told all this to the eleven and to all the rest. 10 Now it was Mary Magdalene and Joanna and Mary the mother of James and the other women with them who told this to the apostles; 11 but these words seemed to them an idle tale, and they did not believe them.